Fall 2017: Kevin Vavasseur, Director, actor and writer, "...And Jesus Moonwalks the Mississippi"
6 April 2017: Javon Johnson. Poetry performance artist-scholar. 10 February 2017: Amelia Rollings. Opera singer, voice teacher. 5-7 December 2016: Laura Leffler-McCabe. Director, actor, designer, producer. 17-21 October 2016: CB Goodman. Physical theatre artist. Fall 2016: Padraic Lillis. Playwright, "Pooter McGraw Is Not Dead Party." 4 March 2016: Baron Kelly. Actor, director, scholar. 19-22 January 2016: Terry Glaser. Director, playwright, actress. University of San Diego. 28-30 October 2015: Michael Bloom. Director. 24 August to 25 October 2015: Tlaloc Rivas. Writer and director of "Johanna: Facing Forward." 8 April 2015: Carla Noack. Performing artist and teacher. ​6 April 2015: Jennifer Martin. Voice actor. 19 April to 8 May 2015: Eric Avery. Performer, director, designer and live artist. 12-16 April 2015: Amy Mihyang Ginther. Vocal-coaching and cross cultural consulting. ​30 March to 1 April 2015: Stephanie Roberts. 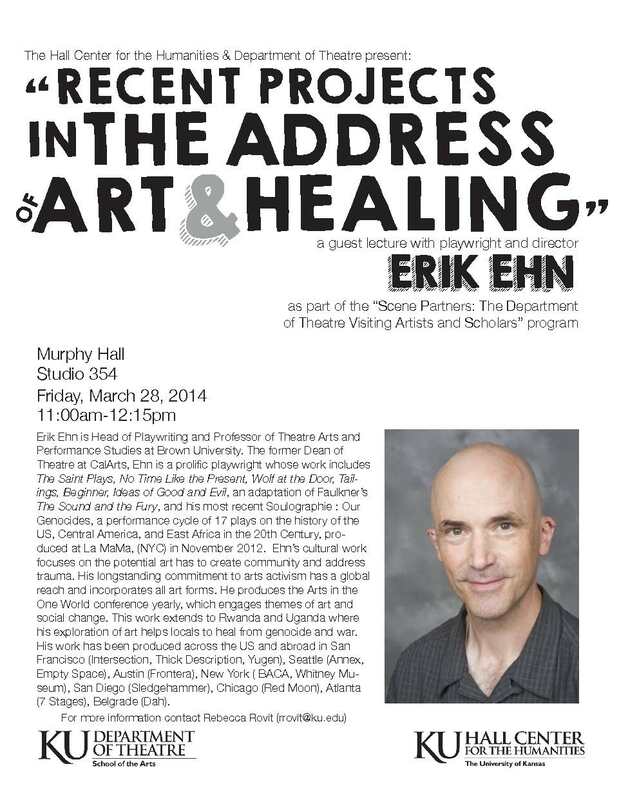 Associate Professor of Physical Theatre at UMKC. 23-27 March 2015: Heather Harpham. 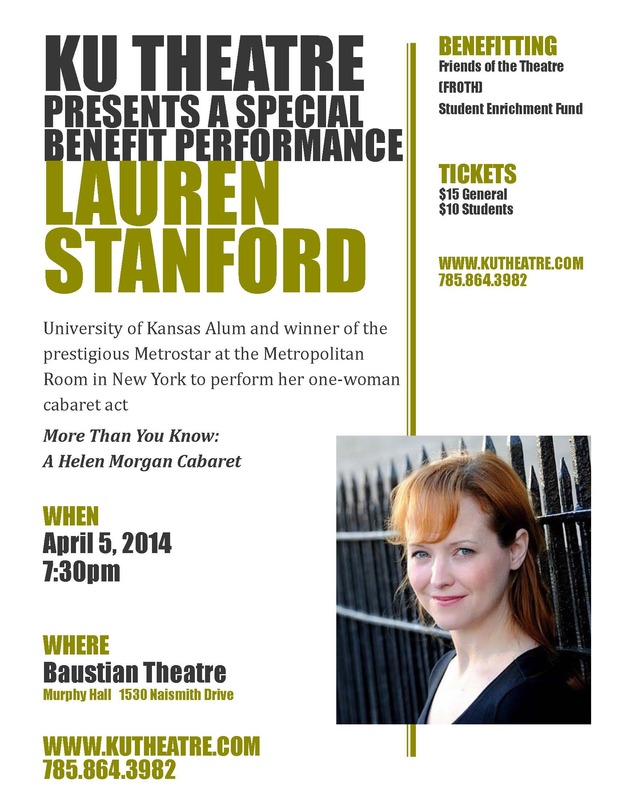 Solo performance, physical theatre and improvisation. ​2-4 March 2015: Amy Virginia Buchanan. Musician, actor, writer, producer. 23-25 February 2015: Tracy Terstriep. Actor. 16-18 February 2015: Dawn Arnold. Performing artist. 9-11 February 2015: Tony Fuemmler. Mask maker, director, teacher puppeteer. ​26 January to 6 February 2015: Matt Chapman. Performer, teacher and director of physical theatre and clown. 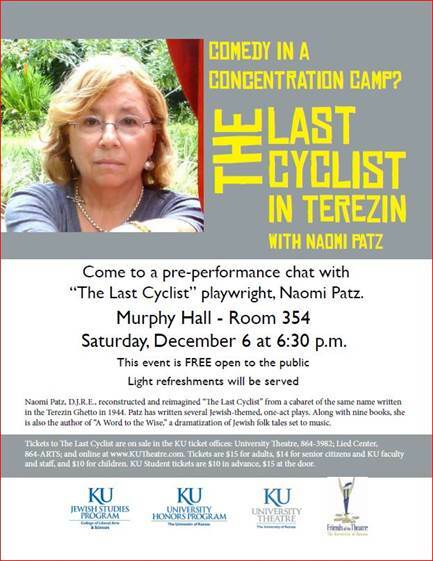 5-6 December 2014: Naomi Patz, Playwright. 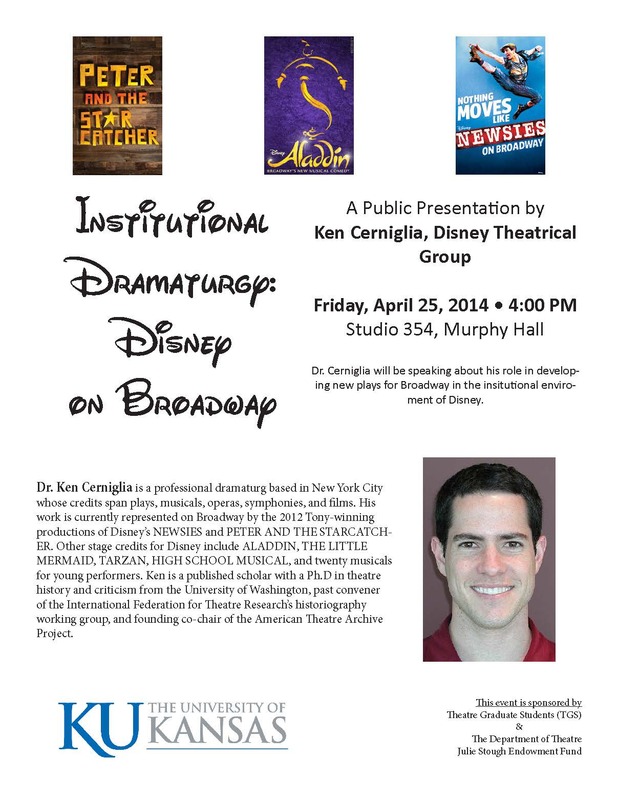 Author of "The Last Cyclist"
24-25 April 2014: Ken Cerniglia, Dramaturg. Disney Entertainment New York. 20-22 April 2014: Amy Hughes, Award-winning Theatre Historian, Brooklyn College. January - March 2014: Walter Coppage, Actor. University Theatre production of Much Ado About Nothing. January - March 2014: Shannon Regnier, Costume Designer, Kansas City. Guest designer for Much Ado About Nothing. 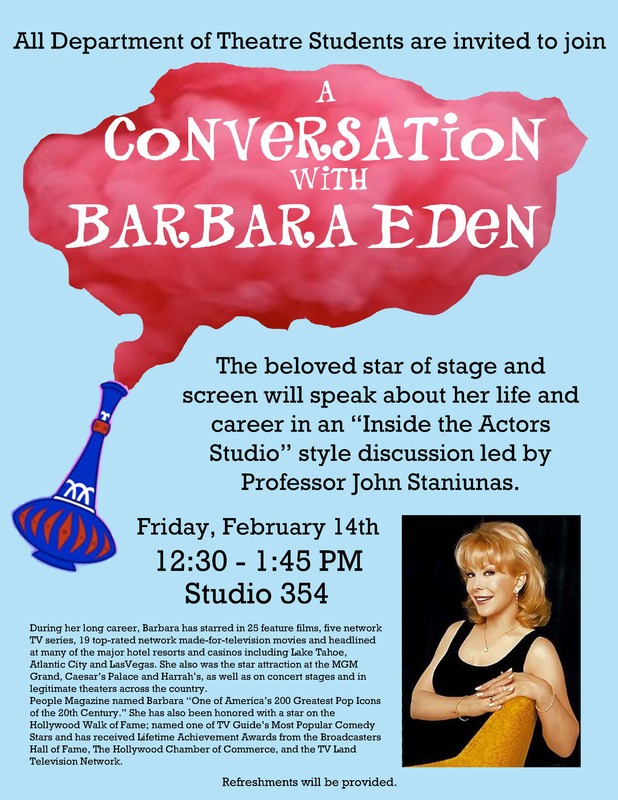 14 February 2014: Barbara Eden, Actress. 3-8 February 2014: Alex Kipp, Playwright, Director, Clown. 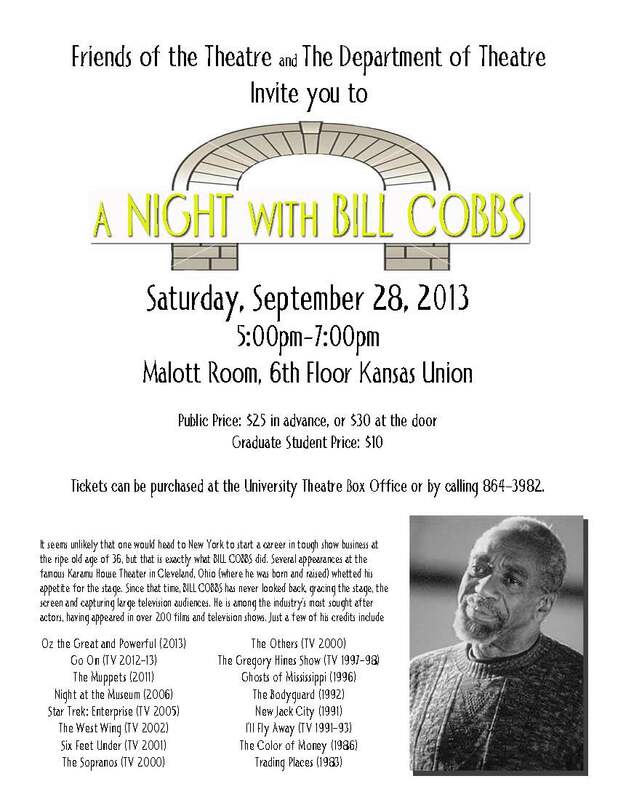 28 September 2013: Bill Cobbs, Actor. 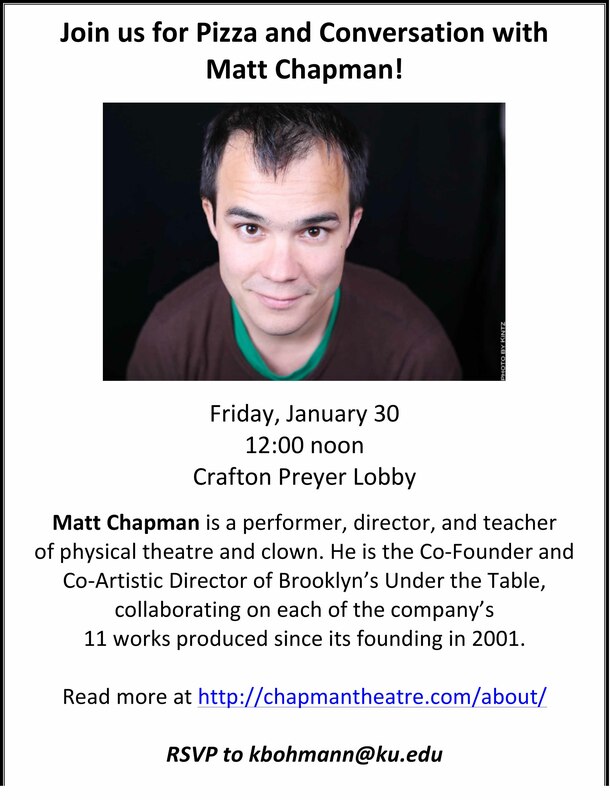 2 December 2013: Matt Chapman & Molly Armstrong, Rubber Repertory. 22 October 2013: Jane Brockman, Actor. Wicked tour.